This incredibly versatile, and easy to clean, One Handed Grater is supplied with a durable plastic support box which holds the grater at a slight angle for easier use and also conveniently collects the grated food. The high quality stainless steel grater features both large and small grater sections on one side and can be reversed to use the chopping blade on the other side. 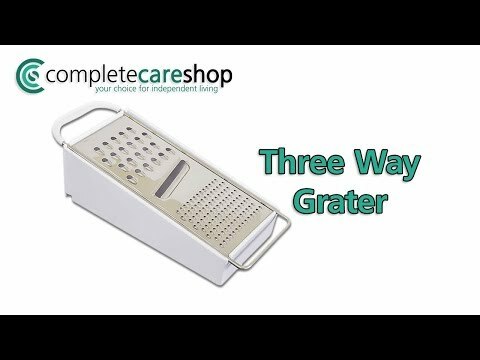 The grater fits easily to its collection box and can be removed just as easily once the food item has been grated, allowing the box and its grated contents to be used easily and with no mess. The box is fitted with non slip feet for improved stability and safety for the user.